Yes, it really is a legitimate domain, unlike many of those which you'll find described herein! Note, if you are here because you're trying to figure out why you have spam claiming to be from "spamtrapaddress.com", be advised that it did not originate from our system. We do publish Sender Policy Framework (SPF) records listing the only legitimate IPs that such mail should come from. If your server accepted it, then decided to bounce it, you need to look at server's configuration and fix its "back-scatter relay" problem! Also be advised that we tag any server attempting to bounce such mail as an open relay in our own system, and will refuse to accept further mail from it. So don't bother trying to send any questions about this. 2018 December: A postal mailing declaring "Welcome to GULF COAST SCRIPTS, LLC!". The "welcome" message from this company, showing an address of 761 Shamrock Blvd in Venice, Florida, is allegedly responding to a recent inquiry "about using our service for Skin Care Management Products through our pharmacy". No such inquiry was made, of course, but the thrust of the "notice" is request for a dated signature, which authorizes this company "and its affiliates" to contact the signer using methods that are violations of FTC regulations, including robo-calling. This is clearly targeted at senior citizens, trying to get them to sign up for services by claiming "our records indicate" the target initiated the contact. If pressed for the legitimacy of that claim, they can say, "Oh, our records may have been inaccurate". One has to wonder if their records used for billing insurance and medicare are just as accurate as their records of inquiry. 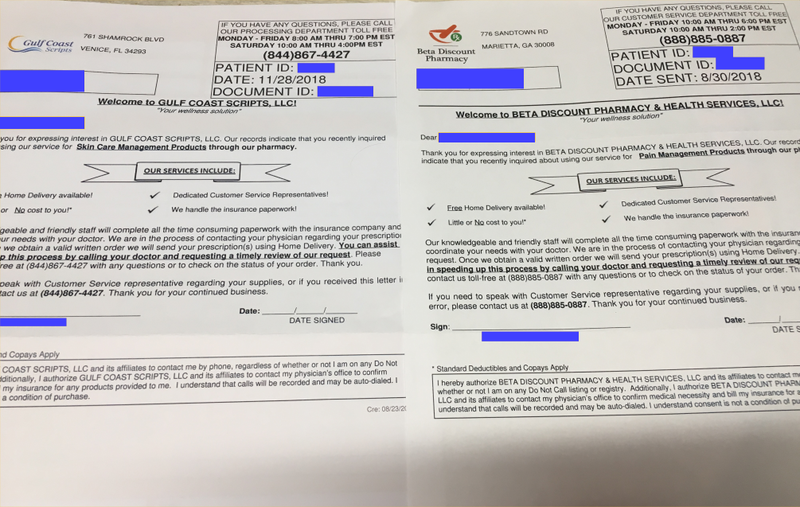 2018 September: A postal mailing was received from Beta Discount Pharmacy & Health Services, allegedly at 776 Sandtown Rd in Marietta, Georgia (but having return envelope addressed to 3640 Enterprise Way in Miramar, Florida), claiming the contact was for "pain medications", rather than "skin care". The format Gulf Coast Scripts letter is identical, with only company name, logo, and phone number changed. And yes, the paragraph of things they want the victim to sign off on as far as authorizing violations of FTC regulations is identical.